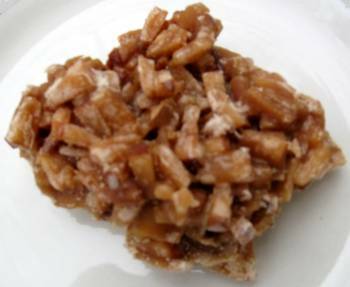 Upload a picture of "Coconut drops"
Add a YouTube Video for "Coconut drops"
A sweet treat made from diced coconut and sugar, and spiced with ginger. At first the diced coconut is boiled and later the sugar and spice is added to the mixture. The mixture is then set to cool and harden on a flat surface.